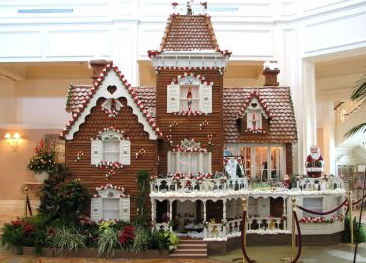 One of the many things to do at Walt Disney World during the holidays is to visit Disney's Grand Floridian Resort and Spa and check out the giant gingerbread house. These delightful cookies can be purchase at the resort. Each year this gingerbread house starts it's building process in June/July when they pastry chefs start making the dough for this popular Christmas display. 5. Remove dough from refrigerator and allow dough to sit at room temperature for about 15 minutes, or until pliable. Divide dough in half and place on floured work surface. Using a rolling pin, roll the dough out until about 1/8 inch thick. While rolling, flour the work surface and rolling pin, as needed. 6. Cut out desired cookie shapes with cookie cutters. transfer cookies to a greased cookie sheet, placing them 1" apart. 7. Lightly brush cookies with milk and sprink with sugar granules as desired. 8. Bake until firm and edges begin to brown, 10-14 minutes. Allow cookies to cool on the cookie sheet for a minute and then transfer to wire racks to cool completely.